I was sitting alone at a table for ten, twenty minutes early and two drinks deep, trying to graph out the best place to sit to ensure maximum exposure to Tommy Wiseau. This was not my usual Friday night, but I sure wish it was. I managed to secure this opportunity by pestering the Creative Director of the Brattle Film Foundation (my ever-patient employer) to play The Room. What I didn’t know then was that The Room is a phenomenon that extends further than the late-night screenings in which my friends and I like to indulge. Luckily, the significantly-larger Coolidge Corner Theatre had the same idea and the means to do it justice. The independent film scene in Boston is fairly miniscule, and the Coolidge guys were kind enough to extend the Brattle folks an invitation to have dinner with the man, the legend, the enigma that is Tommy Wiseau. The Room has confirmed its place in cult movie legend thanks in no small part to Tommy’s continued involvement with the film, which started out (and continues to be) a labor of love. Tommy produced, directed, financed, and starred in the film. Since its debut in 2003, he has been able to retain an air of mystery about himself and the film. Questions like, “Where are you from,” “Why are they playing football three feet away from each other while wearing tuxedos,” “Is Lisa ok? Why does her neck throb like that,” and, most importantly, “Would Tennessee Williams approve,” go unanswered, and that’s exactly the way Tommy wants it. When Tommy and the crew from the Coolidge Corner Theatre walk through the door, I could already tell that I was in for an even more interesting evening than I had originally anticipated. Thanks to some artful seating manipulation, Tommy took the seat next to me and slowly introduced himself. In my excitement, I managed to overlook his dinner companion, who ended up being none other than Greg Sestero (of “Oh, hi Mark” fame). So, here we were: Tommy to my right. Greg/Mark across from me, and Coolidge staff members filling in the spaces between. Though it was almost morning, that’s when the night truly began. Tommy was everything and nothing like I expected. His eyes drooped with what could have been fatigue, or from the weight of being just so goddamn awesome. His shiny blue shirt contrasted perfectly with the lustrous wetness of his long black locks, his face contrasting in its Draculaean paleness. Despite my initial nervousness, I suddenly felt completely at ease, owing either to Tommy’s friendly attitude, or, possibly, to the giant Sapporo that I was consuming like my life depended on it. Greg (hereafter referred to as Mark) and I chatted briefly about our shared pescatarianism, and then Tommy took the stage. Although I was paying close attention to his every movement, I found myself surprised when appetizer after appetizer began arriving at our table, courtesy of his discreet ordering skills. As the food arrived, Tommy insisted that we pass the plates around the table, cooing over and over again about how we should all partake, and how he, himself, isn’t much of an eater (though he had ordered no fewer than four plates). During the meal high-fives and fist bumps were passed around as much as his own dinner plate. He is apparently fascinated by tattoos, commenting heavily on the inked arms of our co-diner, even giving a hint at a possible new project focused on them. An insider detail: Tommy has “a small tattoo somewhere on his body,” but refuses to say where it is. Anyone who has seen The Room can attest to the fact that it must be pretty well-hidden to avoid being noticed during those rather, er, intimate love scenes. I was also amused by our discussion on the strength of tigers, about which we managed to converse for around ten minutes (a.k.a the time limit of my tiger knowledge—I knew working at a zoo would come in handy someday). The talk then turned towards what was most likely the favorite topic of conversation for everyone at the table: The Room. Tommy took the reins, going around the table in sequence and asking everyone what they, personally, liked most about his raison d’être; pointing across the table at our companions and saying “Now you,” moving on if they didn’t answer quickly enough and genuinely seeming to be interested in everyone’s thoughts on the film. Tommy is obviously extremely proud of The Room, and thoroughly enjoys the hoopla that surrounds him and the film wherever they go. He is Johnny, though he tries to distance himself from that kind of close emotional involvement with the character. A personality quirk not portrayed in the movie: Tommy’s proclivity to use the phrase, “I rest my case” as often as possible, usually when there is no case to be rested. He dominated the conversation for the rest of the evening and we were just along for the ride, following the ebb and flow of the quirked-out mind of Tommy Wiseau. Though you wouldn’t be able to tell from Tommy’s still-full plate, dinner was coming to a close. We took a few group photos and then awkwardly began to request personal photo ops with the man, which he happily provided. 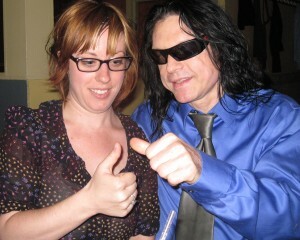 Slipping his arm around my waist and putting his sunglasses back on, Tommy prepared for the picture by attempting some kind of alien thumbs-up hand motion, the likes of which I’ve never seen before. I was confused but more than willing to go along with whatever vision for the picture he had in his mind. Then it was over. Tommy and Mark were led over to the Coolidge to bask in the adoration of their sold-out show, and we were left dazed in the wake of what had just happened. Though we were only in his presence for about an hour, it felt equally much longer and shorter, and, in a way, like it hadn’t happened at all. I admitted to former Coolidge Director George Bragdon that I had sent out a bunch of exclamation point riddled text messages every time I’d gone to the bathroom. He admitted that he had been updating his Facebook status at the same time. We shared a jittery, excited mental high five and headed over to see what else Tommy could possibly bring to the table.